He learned how to cave in Utah and Nevada. 20 years later in Thailand, the stakes were much higher. (Francisco Kjolseth | The Salt Lake Tribune) Born and raised in Salt Lake City, Josh Morris, 42, started climbing in the Cottonwood canyons at a young age and then began caving in college. Fluent in Thai, Morris has run a rock climbing business in Thailand for the past 15 years, and because of his expertise in caving and his mastery of the language, he ended up playing a central role as an international coordinator during the recent rescue of the trapped soccer team in Thailand. When he started exploring cave systems in Utah and Nevada, crawling through mud and dirt and trying to sneak into tight spaces to see where they led, Josh Morris felt like a little kid searching for secret treasure. Twenty years later, the stakes were higher. Now, he was working with rescue crews against time and all odds to find a way into the Tham Luang cave in northern Thailand, where 12 young soccer players and their coach had been trapped for days in the dark and the cold. It had been 10 days since monsoon rains had flooded the passageway the Wild Boars team had walked into so effortlessly, making it impassable to all but the most skilled divers. Morris explored a hole on the south side of the cavern alongside the U.S. Air Force rescue team that they saw as one of their best leads for finding the boys. Another dead end. And this one had occupied the time and energy of at least 20 people every day for three days. That’s when Morris, a Salt Lake City native, became immersed in the high-stakes rescue that commanded international attention for 18 days. He worked first as one of the few volunteers with caving experience and then, once rescuers realized that finding a cave entrance was unlikely, played a central role in ensuring smooth communication among the British, Australian and United States rescue teams and the Thai government. Morris first came to Thailand in 1999 to teach English as a student from Princeton University. 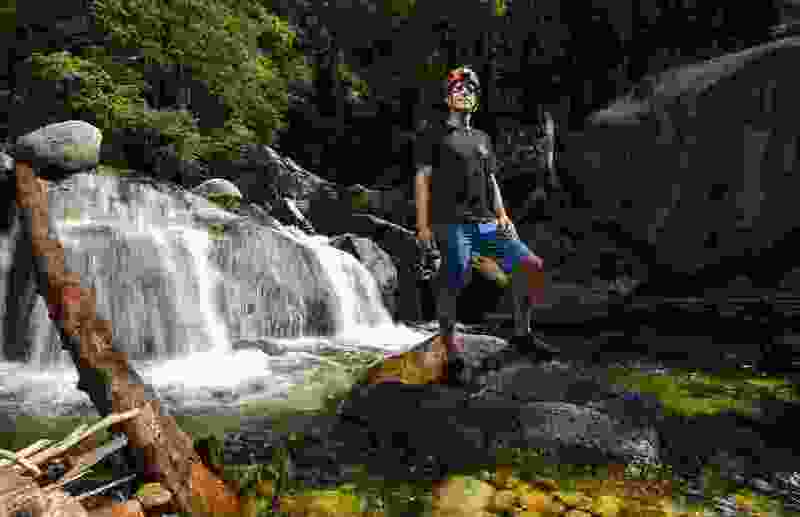 A journey that started as a year or two abroad never ended after he married Khaetthaleeya Morris, a Thai native, and grew a successful rock-climbing company and community called Chiang Mai Rock Climbing Adventures. So he stayed. When the boys, who ranged from age 11 to 16, wandered into the cave, it was June 23 — not yet the Thai rainy season, which begins in July. Their abandoned bikes and belongings scattered at the mouth of the cave served as an answer to the question of why so many sons had never showed up for their dinners. The number of volunteers eventually grew to more than 9,000, according to The Washington Post. Still, Morris tried to be helpful from afar, conducting interviews with CNN and BBC as an experienced caver with a deep knowledge of Thai culture, and helping his brother-in-law coordinate with other cavers. But he could feel Uppakham growing frustrated with the lack of coordination among various groups, which sometimes led them to waste time on holes another team had already finished exploring. Uppakham thought Morris might be able to help bridge the communication gap, so he came. Over the next few days, Morris explored a number of dead ends that had seemed to the rescuers, who were less experienced with caving, like solid leads. “I can tell why they thought it was going to go [through],” he said of one such lead. “Because they wanted it to go, one. That’s always the biggest problem is your emotions get in the way. And, two, it looked like it could go. But there were none of the other things” like airflow — signs that were obvious to more experienced cavers. Before the search became a rescue, Morris and others worried the divers “were just going to find bodies.” But even after the team was located alive, the list of concerns kept swelling: declining oxygen levels, lack of food, risk of illness and infection and a growing urgency to rescue the boys while the water level was still low enough to do so. At that point, rescuers still thought they had options for rescuing the boys. Maybe they could walk them out at the end of the rainy season in October, or drill into the cave to find them, or they would discover an alternate entrance. But soon, the rescue teams realized there would be no accessing the main cavern from the outside, that leaving the boys in the dark for months was more of a death sentence than a legitimate option and that the chance of creating a cave-in within the complex rock system made drilling almost equally risky. The only option left was to dive them out. The boys had no diving experience. Once the decision was made to dive the boys out, Morris’ role shifted. His job now was “to make sure that what [the rescue teams] were thinking about what is possible and what needed to happen was being communicated properly and through the right channel and in a culturally appropriate way,” he said. Most days, Morris was up at 6 a.m. and in bed around 1 a.m. the next day, all the while under intense pressure to communicate complex issues clearly and correctly on the borderline between two distinct cultures and languages. Vernon Unsworth, a British cave diver who has spent years mapping the Tham Luang cave system, said Morris and his team from Chiang Mai Rock Climbing Adventures were an “integral part” of the rescue. Morris worked closely with the area’s lieutenant governor, Passakorn Bunyalak, throughout the three-day rescue operation, where rescuers hoisted the boys out of the main cavern and through a complex network of ropes and air tanks, part of the way in stretchers, over jagged rock and muddy passageways and in dark waters where they could see less than six inches in front of their faces. Four boys came out — alive — the first day. And the next day there were four more. But even after two successful operations, Morris said tensions remained high until the last day of the rescue — particularly after the death of Samnan Kunam, a former Thai navy diver. “Every dive is just as risky as the first,” Morris said. Miraculously, the last day was as successful as the two preceding it. And when the last boy was out, and the Navy SEALs who had kept vigil with them in the cave emerged hours later, everyone felt a surge of relief amid a sense of disbelief. (Photo courtesy of Chiang Mai Rock Climbing Adventures Co., Ltd.) Josh Morris meets with the parents of the boys of the Tham Luang Cave Rescue at the Chiang Rai Hospital, Chiang Rai, Thailand, July 2018. Though Morris is still decompressing from the experience, he also recognized that the work spurred by the boys’ entrapment isn’t yet finished. He hopes to work with the Thai government to establish systems that can keep the community safe while preserving access to the country’s vast landscape of underground treasure hunts.